HAPPY 2ND BLOGIVERSARY DELUXSHIONIST -Nothing to say but I'm happy that it's been a great of blogging years for me, thank you for Hermes who send me the orange box and Kenzo for send me a very sleek sketch for deluxshionist blogivesary LOL just kidding, obsessive kidding, I even wrote "HBD Deluxshionist" by myself HA!!!. But I have to appreciated what I have been through with this blog, so many warmest thanks and hugs for me, you and us. 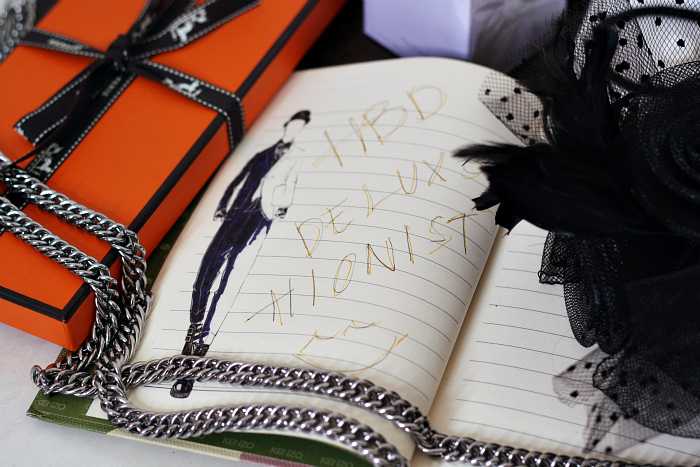 It is supposed to be posted on 1 October, but it is still October right, so Happy Blogiversary Day Deluxshionist. I wish for massive and better improvement, I wish that my blog brought happiness and entertains to your days, and I can contribute to fashion journalism more and more than ever, thank you *cheers* *confetti*. In fact, I am so happy that someone else out there was starting write their blog on October 2010 too, so I am happy for you too. Haha I love it-- "Thank you Hermes and Kenzo" haha yeah I wish too! Thanks for your comment, your outfit is great. Happy b'day to your blog!